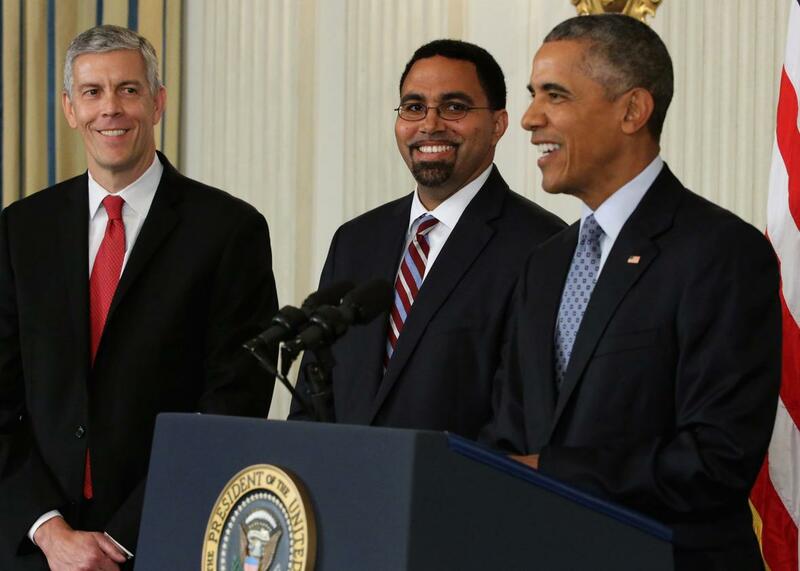 Arne Duncan is stepping down—and his successor John King will have a much tougher job. Arne Duncan’s decision to leave his post as secretary of education—with just one year to go in his boss’ presidency—could mostly be about family, or it could mostly be about politics, or it could be a jumble of the two. But it is clear that Duncan’s successor, John King, who is already working as a deputy U.S. education secretary and will hold the secretary position on an acting basis so that President Obama can sidestep the Congressional approval process, will inherit two political schisms that have widened substantially over Duncan’s tenure: one falling along standard party lines and the second an intraparty divide pitting Democrats against Democrats. Both have huge implications for the future of education policy in America. The growth of neither schism has been the complete doing, or undoing, of Duncan—at least as far as we know. But his major policy priorities, including support for charter schools and the Common Core standards, have, in different ways, stoked the flames of both fires. The about-face symbolized a broader retrenchment among Republicans who, for reasons of both political ideology and political expediency, suddenly sought to distance themselves from the Democratic president on the issue of education. Many of them not only began raising a ruckus about the Common Core but started pushing for expanded school voucher programs. Vouchers feature a more wholesale form of privatization—and less government regulation—than Obama’s preferred vehicle for school choice, charter schools. The Republican message to Obama and Duncan and the American electorate seemed to be: However “conservative” or “reform-minded” Democrats become on education, Republicans will inevitably revert to seeing—and depicting—it as wussy federal overreach, particularly in a election year (unless, that is, some of them are momentarily caught up in an elephant-on-elephant fistfight over the issue). And it’s not just from the right side of the aisle that Duncan’s education agenda has picked up more flak. There’s long been a divide inside the Democratic Party between liberals who generally favor and liberals who generally oppose Duncan’s push for school competition, test score-based accountability, and the expansion of charter schools. But that divide has crystallized and deepened over the last few years. There’s no single reason. The 2011 release of education historian Diane Ravitch’s The Death and Life of the Great American School System: How Testing and Choice Are Undermining Education certainly helped galvanize teachers, in particular, who had long been skeptical of Duncan’s agenda. In some communities, middle- and upper-middle-class families have been leaders in the growing movement to “opt out” of standardized tests. It’s simplistic to depict the “opt out” or anti–Common Core movements as too monolithic (Duncan once dubbed the opponents “white suburban moms”). But as the opposition to Duncan’s policies has become more populist, and less overtly political in some communities, the changing nature of the pushback has aggravated existing tensions among Democrats over education policy, and endangered some of Duncan’s favored reforms. So what does this all mean for John King, New York state’s former education commissioner, who is expected to continue Duncan’s commitment to Common Core, school choice, and a changed approach to evaluating teachers? There’s only a year left in Obama’s term after Duncan officially leaves the building in December. And the administration has a few other hot areas (like Iran and health care) that might take precedence over education. King will be left trying to maintain support—and quiet opposition—to education initiatives that were set in motion during somewhat less rancorous times. And he’ll have the benefit, and challenge, of doing that largely outside the eye of national reporters and pundits, whose attention, for the most part, is otherwise engaged. In some respects, the pushback is more decentralized, and less Washington-based than ever, making it harder to contain and address. The real significance of the rising discord might very well befall the next administration’s secretary of education, whether Republican or Democrat. If that person hopes to help push through any major initiatives on the scale of Race to the Top or Common Core, he or she will not have the luxury of an (admittedly fragile) bipartisan coalition. Instead, the next secretary will face the more daunting task of building one up.